Rocks assistant Robbie Blake insists there’s no other dressing room he’d rather be in when Bognor hit their stride. The former Portsmouth coach was speaking ahead of an important week for the Nyewood Lane side which sees the injury-hit side play two games in five days. First is the visit of Tonbridge Angels, who defeated second-place Haringey at home last time out. Then it’s a midweek trip to fourth-place Merstham on Wednesday (7.45pm) as the fifth-placed Rocks looks to keep in playoff contention. 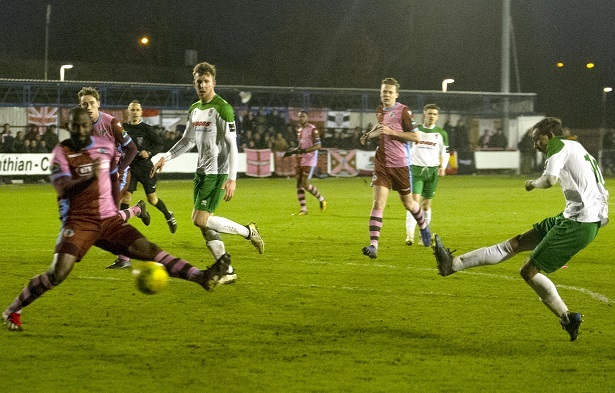 Despite having more than six first team players unavailable for a range of reasons, they head into the week full of confidence after an excellent second half performance sealed a 3-1 win at Corinthian Casuals last weekend. And, speaking after that win to Rocks Radio, Blake said that the team have nothing to fear from the remaining three months of the campaign. He said: “We have to be on the front foot and once we do that and play our football, we fear no one when we’re on it. It was very much a game of two halves at the Casuals’ historic King George’s Field. A poor first 45 minutes saw Rocks go in at the break one down after an uncharacteristic error from keeper Dan Lincoln allowed a long range effort from Hamilton Antonio into the net. With manager Jack Pearce missing the match due to illness it was up to Blake to deliver the half time talk. His words certainly had an impact with second half sub Tommy Scutt scoring with a tame header before Jimmy Muitt bagged a double to wrap up the win and take his personal tally to 27 goals for the season. Victory keeps Rocks fifth in the Bostik Premier just two points behind Lewes in third. Things are tight, though, with a further two points separating Bognor from Worthing in tenth. But Blake believes the positive attitude within the squad will stand Rocks in good stead as they move towards the business end of the season. He said: “We have not got a bad lad, we have got people pulling in the right direction. “Sometimes they will make mistakes but we are a really good team full of quality. ← Three at the back here to stay?